It's no secret that I love food. The first issue of Paleofuture Magazine and the first episode of paleofuture.tv are certainly a testament to that. And some might even consider me an adventurous eater. I recently tried cow brain for the first time and will occassionally indulge (much to the disgust of coworkers) in a tongue-stuffed burrito. But for some reason I just can't bring myself to eat bugs. I don't know if it's the texture or the fact that I'm already so full on spiders* after a good night's rest, but a grasshopper salad has never appealed to me. 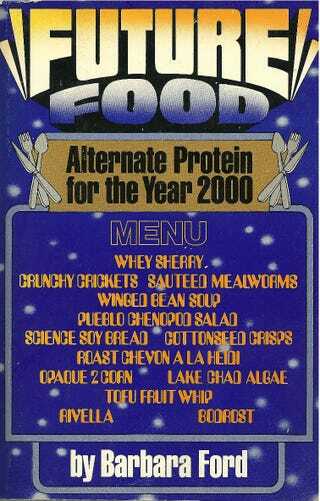 The 1978 book Future Food: Alternate Protein for the Year 2000 by Barbara Ford includes a menu chock full of creepy crawly delicacies and scientifical concoctions. On Ms. Ford's menu you'll find not only crickets and mealworms, but also pueblo chenopod salad, science soy bread, roast chevon a la heidi, opaque 2 corn, lake chad algae, and tofu fruit whip. Predictions about a move away from animal products or simply finding "alternative proteins" aren't new. This 1914 article from a Montana newspaper predicted that by the end of the 20th century animal food would be abandoned entirely. Ford's book doesn't predict the end of humans eating meat, but she's a big advocate of finding alternatives to what's currently considered acceptable for our plates. The book presents a fascinating collision of post-WWII food science utopianism and 1970's health food earthiness that I haven't often come across. And yes, you read that right, chapter four is indeed titled "The Magical Fruit." In this fascinating and important book, Barbara Ford tells us that by the year 2000 Americans will obtain a large portion of their protein from alternate proteins: food sources such as beans, high-protein grains, non-dairy cheese and milk, unusual forms of marine life, leafy plants such as alfalfa that are now fed exclusively to livestock, one- celled plants such as algae, strange plants you never heard of but undoubtedly will, and an assortment of "weird" proteins that includes insects, reptiles, rodents, small game such as possum, raccoons, and even dogs. Our sense of obligation to other people as well as our hardheaded interest in a stable world society almost demand that we cease feeding 98 percent of our soybean crop to animals, as we do today. The use of alternatives to animal protein frees vegetable protein for human use. The chief reason, however, for the predicted change in the American diet is economic. Traditional sources of protein cost more than they used to; from all indications they will continue to rise in price. Future Food is an invaluable and assiduously researched study. In it, Barbara Ford appraises the most important work being carried out 61 scientists to develop new kinds of protein, and she assesses their value. She advises on where to find these new food sources and how to incorporate them into our diet in the most nutritious form. She shows us that by the year 2000 we will be eating Squid Stew and Buffalo Gourd Meal and loving it. *Yes, I realize spiders are arachnids. Shut up, nerds.